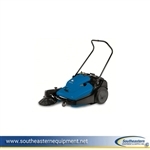 At Southeastern Equipment, we trust in Windsor commercial floor cleaning equipment to deliver effective results. Windsor Karcher is known for using innovative technology to create productive and cost-effective cleaning solutions that cover more square footage than most standard machines. Our used and reconditioned Windsor floor machines, such as the Saber floor scrubber and the Chariot carpet cleaning machine, reduce your business costs even further. We take these previously used Windsor Karcher floor cleaners and completely refurbish them with brand new parts and accessories until they’re as good as new. We offer most of these cleaners at almost half the price of a comparable new unit, and we’ll even work with you to find an appropriate financing option. We only have a limited supply of these used models, so order quickly! If you need help finding the exact machine to fit your business’s needs, call our knowledgeable customer service team for assistance.